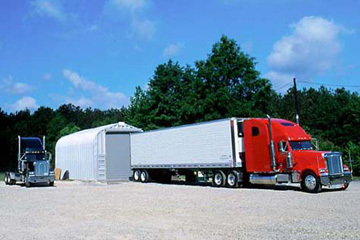 Our prefabricated metal truck garages are an excellent choice for our customers in the trucking industry. Whether you have a fleet of 18 Wheelers or you’re just an owner of one, We offer a prefabricated metal building that features a clear span design, up to 200 feet in width and unlimited length possibilities. For companies or individuals who want an affordable solution to having ample space for their engine repairs, tune-ups, wheel balance and alignments, a metal building for transfer truck garages from U.S. Buildings is an excellent choice. Our products help you keep your trucks safe from the elements and from theft. U.S. Buildings pre-engineered steel buildings are fully customizable and can even save you 50% when compared to the time and costs associated with traditional construction. Plus, we ship factory direct so we eliminate the middle man, getting you the best price you’ll find in the industry.